People often joke that their office is so small it feels like they are working in a closet. This well laid out and organised home office actually is in a closet. Lifehacker reader Chris Grossmeier recently moved and found himself without the space for a home office. 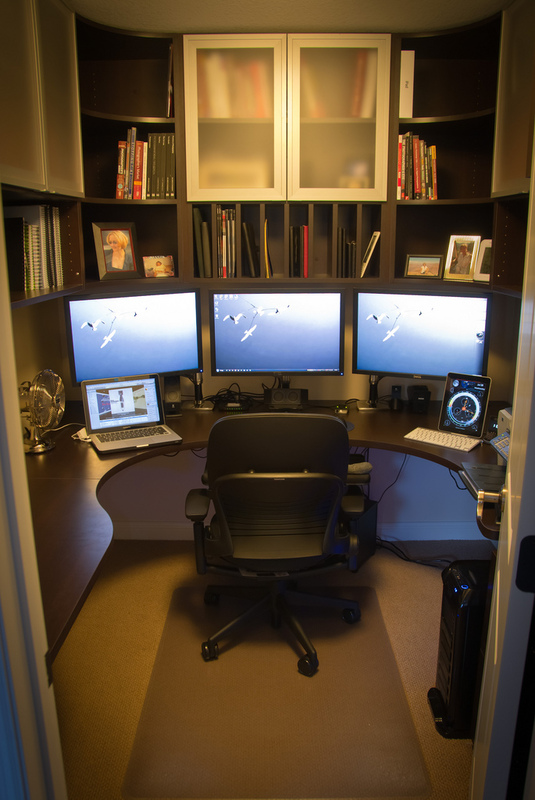 Rather than resign himself to working off the dining room table he converted a walk-in closet to a home office. Home Office 2.0: An upgrade from Home Office 1.0. While this is inside of a walk-in-closet, it does free up a room as a guest room. With a lock on the door, I can keep my office out of sight and out of mind during the holidays when friends and family are visiting. Some details... the room is a walk-in closet. 75" wide x 96" deep and 8' tall. The custom desk and cabinets were built by Techline of Excelsior, MN. What you do not see are the full height shelves behind the door on the right and the upper cabinets that wrap around the room to the door on the left. Almost all of the cables are suspended under the work surface to keep them out of sight and out of mind. The small fan on the left was a recent addition to keep things a little cooler. the room does have a dedicated air supply and return vent. it also has a dedicated 20A quadruplex outlet on the wall in front of the chair. In all, I sustain around 500watts of power when the office is running. Everything is separated out to essential and non-essential power strips. All feed into UPS's to ensure no brown outs or surges. As a software engineer for VMware, the extra monitors are a blessing. managing Labs, multiple VM's, and email, a browser, and my desktop need the extra real estate of the three Dell U2410 monitors. With the addition of the Macbook, iPad dock, and my blackberry... I may never need to go to an office again. This sure does beat the old folding table. It is also the only time you will ever see my office clean and organized. It will be a steady decline of organisation and cleanliness from here on out. Even if his office does end up a total mess in a week, he won't have much to clean up thanks to the compact proportions of the office! We're quite impressed with what a great job he's done turning a closet into a functional, albeit lilliputian office and would love to hear from other readers with similarly compact offices. It's not a bad idea, as long as you're OK with not having any natural light.